Very early on in my pregnancy with Penny I started to notice I was developing stretch marks, it must have been before 20 weeks that I started seeing the bruised like starting's of them. I knew I was going to get them as growing up I got stretch marks on my hips, and legs. They never bothered me as a teen but pregnancy stretch marks are a whole different ball game... so how would I feel about having thick stretch marks all over my tummy? Soon after birth they are angry, thick, itchy, sensitive, red shiny marks. 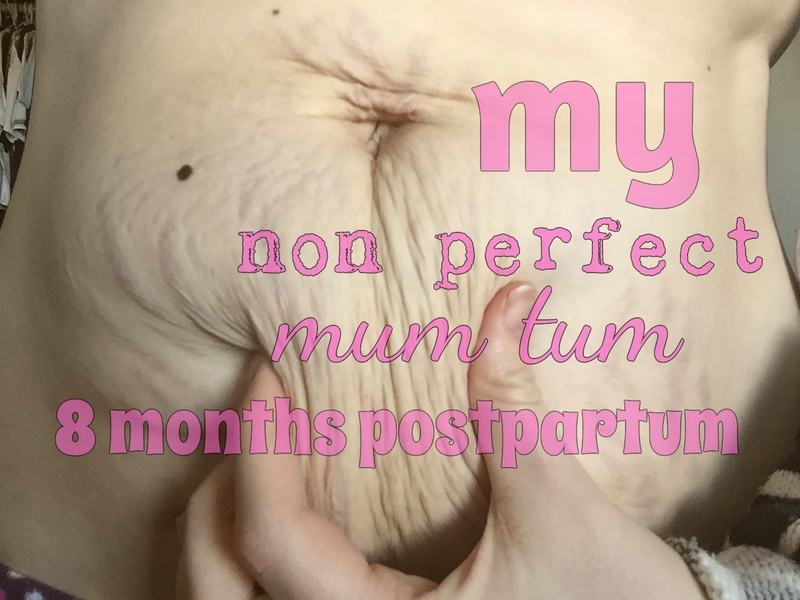 My belly went down very fast after Penelope was born I believe that was due to breastfeeding and I feel it did me a massive favour on shifting some of the weight too. As my belly decreased in size it become clear how bad my stretch marks really were. Some were even 1cm thick or more. Sorry for the TMI but they started above and around my belly button and came right down to my pelvic bone on my lady parts. My belly is by far not perfect I have a big pocket of saggy skin (a mummy pocket as I call it) that shows up in my tops and my jeans. I don't know what to wear to cover it up. It's just there. 8 months down the line my postpartum belly is wobbly and jiggles around. After trying to diet and exercise my way to a flat toned tummy it just isn't happening for me, I had abs at one stage in my life believe it or not. It's soft and squidgy, my Penny loves to sit down or lay on it. My belly button is wonky and will never be the same again. Although they have faded to a silver likeness they are still very noticeable. I've clearly had a child. Somehow it doesn't bother me as much as I first thought, no they are not pretty and admittedly I don't like my stomach being touched but they were just a small price to pay for having my beautiful baby daughter Penelope. They haven't made me love myself any less if anything they remind me how proud I should be. I gave my all and spent 9 months nurturing, caring, and loving my unborn child then proceeded to deliver her into the world. Damn right I'm proud of those marks. Of course it would have been great to be one of the lucky few who didn't get one stretch mark or didn't end up with saggy skin or struggled to get there tummy's back to how they were pre pregnancy but I'm not one of those lucky lady's. I have to bare the scars of pregnancy and I'm ok with that. This is a very brave post hun and I think your attitude to your body and the way it's changed is amazing. Like you say, they are the signs that you carried a baby and that is something to always be proud of. I would be quite intrigued to see what my belly would look like now without the stretch marks. glad your okay with your mummy belly too! Such a brave and honest post. I have stretch marks too! I see them as Emily's drawings. I do cover up though, I'm really not comfortable in my own skin yet, but I'll get there. Your'll definitely get there Steph, one day your'll accept it and feel proud of what your body has done. It takes a lot and I still have a way to go myself. This is such a brave and honest post, Lorraine! Surprisingly, I didn't get any stretch marks on my belly, but I do have a C-section scar and it took me a while to get used to that and learning that it is a part of me now. But, like you, I think about all that happened for that scar and I know it is well worth it! Aww thaknyou Jade, oh yes child birth brings all different scars, whether it be, C-section-stretch marks-vaginal tears, they come in all shapes and sizes but at the end of it all, they make something totally worth it all.